HRD Minister Prakash Javadekar is anticipated to hold a meeting with the Indian Institutes of Technology (IIT) members on 23rd August to discuss on the issue of National Authority for Testing (NAT). NAT will modify the way entrance examinations to IITs and other top-notch engineering institutes are conducted. The HRD Ministry has been putting in efforts from the past few months to establish NAT to evaluate the abilities of aspirants before they appear for JEE. The marks secured in NAT would serve as the basis for short listing the candidates for the Joint Entrance Examination (JEE) 2017. The marks and rank secured in the JEE Advanced serve as the basis for the entrance to the IITs. The HRD Ministry began putting in efforts on the proposal for setting up the NAT after a Committee set up by the IIT Council suggested changes to the entrance examination structure at these Top-Notch institutes including establishment of a National Testing Service. According to the recommendations, the testing service would conduct tests based on which approximately four lakh candidates would be shortlisted for JEE. 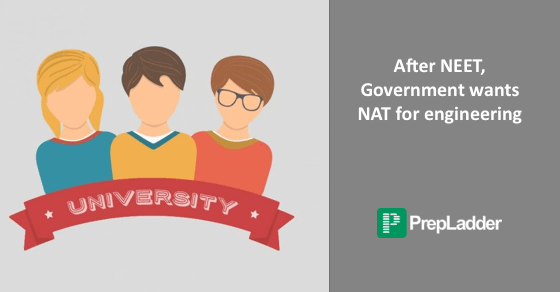 The committee stated that NAT would be on similar lines as the current JEE Advanced and would be designed to test the knowledge of the candidates in Physics, Chemistry and Mathematics. NAT would be conducted by the IITs. The committee had suggested that 40,000 examinees would be then assigned the ranks based on which they can seek admission to the IITs and NITs on the basis of a Common counseling. Most of the recommendations of the Ashok Mishra – led Committee of Eminent Persons (CEP) that presented its report to the Government on November 5 last year emphasized on weaning away the IIT aspirants from coaching institutes. Stay Tuned for the latest JEE updates!